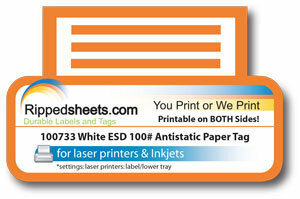 This acid free tag is of near archival quality, is printable both sides and is electronic image capable. It was designed for demand publishing requiring an ESD specification. Rippedsheets.com can microperforate and/or folding score these sheets in low to medium quantities, so they can fill a variety of needs. Microperfing and/or scoring twice across (AC) or twice down (DN) is included in the per-sheet price without a die charge. For more complex needs, please see Microperfing/scoring die costs. This material meets US Postal Service Automation Design Standards for postcard minimum weight ( 7 pt. (.007″)).